So, when reviewing these books, I try to consider the people that might be interested in buying or using these books, and to me, I think there are two important audiences: the primary audience probably being brand new prospective Dungeon Fantasy RPG, and the secondary being the deeply entrenched GURPS enthusiasts. I try to make sure that I provide notes that are interesting to both parties in these reviews to help people make informed choices, because sometimes RPGs are an investment, and it feels good to be walking into a purchase feeling confident that you are getting what you signed up for. Not sure why I felt like putting that up, but, that's that - let's take a closer look at Dungeon Fantasy - Monsters. list seems longer than I realized. 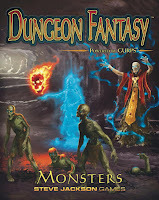 This is another book among other that come with the main Dungeon Fantasy RPG boxed set: a decent sized bestiary of interesting monsters to give GMs some help in populating dungeons. This is a 66 page document, excluding cover art, some useful inserts, the one page introduction, index, and some GM worksheets, we have 59 pages beside. Chapter 1, 5 pages long, talks about some of the rules of encounters, and some of the important exotic combat rules that come up when fighting undead, eldritch, and uncanny beings that break the typical rules of combat that bound the nominal 2 armed, 2 legged, bipedal hominids that comprise most PCs. Chapter 2, 6 pages, are a list of exotic advantages, disadvantages, and other traits that are not included in Adventurers. 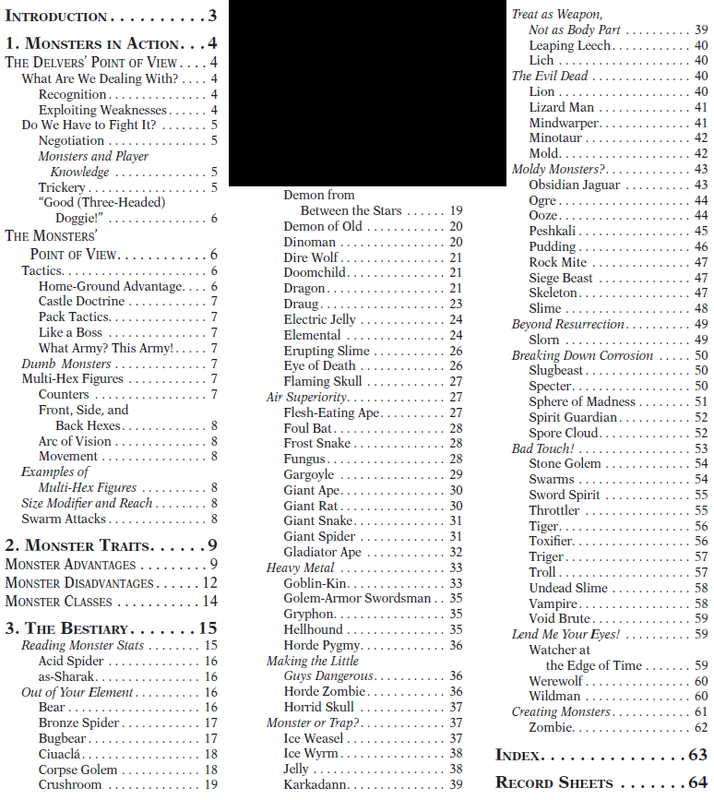 Finally, the remaining 48 pages goes to the bestiary consisting of, if I count correctly, 78 monsters at least, and many of those having minor variations, that if it matters, might push the count northwards of 100+. This chapter talks about the mechanics of identifying monsters, negotiation, advanced tactics, and special combat mechanics relegated to monsters, like how to handle a huge monster on the map, or swarms of tiny monsters. This is a useful chapter for everyone to read, players especially would benefit from the first half of the chapter because of the useful tips on how to get their points' worth from knowledge skills and how to pull capers on the monsters. The second part gives GMs advice on how to get into the monsters heads and what type of things to remember when looking at monster stats. Adventurers contains the majority of advantages, but it assumes nominally human-like delvers, meaning that several more exotic traits that might be genre defying or inappropriate for them, but perfectly suitable for monsters are give in this chapter. Even as someone who is somewhat GURPS experienced, this is a great reference because the abbreviated descriptions of the traits get down to the mechanically useful brass tacks and tell you exactly why, for example Vibration Sense matters in combat in a darkened room and how players might attempt to circumvent a monster that relies on it. 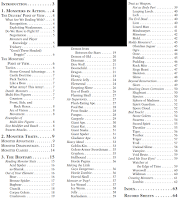 The chapter ends with a list of Classes, a feature exclusive to monsters which entail a bunch of 0 point features and can be a useful shortcut for determining if a certain tactic is available in a fight. For example, Demon class monsters are all susceptible to the Banish spell as a general rule, making it a possibility if the players know for absolutely sure that what they are fighting is not a Spirit, some fallen Divine Servitor, or some equally terrible, but entirely inscrutable Elder Thing. Really, the reason you will want to read this book though, is because of the menagerie of monsters. They are organized in alphabetical order. 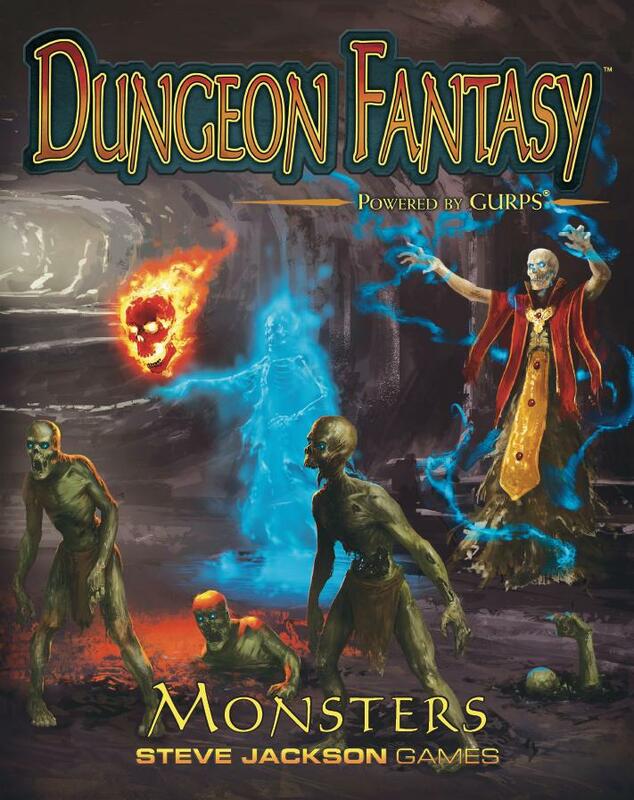 Each monster has a full Monster Stat Block, a standard in GURPS that includes all the mission relevant details, like how much damage this thing can do, and how good it can dodge, without any of the tertiary details you will likely not need for an encounter, such as a Corpse Golem's favorite language, sport, and board game. There's lots of helpful advice with each monster to make the encounters feel more unique, or to remix it and reuse it in a novel way. The list is good with monsters across the entire gamut of distracting fodder to seriously dangerous monsters and masterminds. I kinda wish there was some guidance on which monsters are which, because especially to a brand new GM, it might be difficult to tell from a glance at the stats on, say the Doomchild, whether it's fodder or a danger (their low attributes belie their decent anti-delver capabilities) Similarly, at a short glimpse, a Flesh Eating Ape seems like bad news, but it has several weaknesses that curtail it's effectiveness. Fungus? 0 IQ and 0 ST, but can absolutely rock a party's world. GMs should read stat blocks very carefully, and be ready to improvise if a fight is too easy or too hard while they get comfortable with the mechanics. Rome is not built in a day, and GMs aren't perfect on the first session. The GM record sheet at the end of the book is a nice thought, but I think again that there are some space usage issues: (some single number fields are half a line for example, while the notes section can barely fit a full sentence) That said, they are good food for thought, and organizing monster stats on index cards is a good strategy. I have a lot of first hand experience with a lot of the monsters in this book, lots of interesting fights to be had, and there are way more interesting encounters to be had here than, "guy with sword, guy with bow, and fast guy with knife." Go wild with it, have fun, and send a few characters to the hospital and/or morgue.